Can we just talk about shoes for a moment? I go through phases of loving shoes or bags, and shoes are definitely having their moment right now. Since I moved out, I’ve massively cut my shoe collection down and I’ve realised – apart from my Vivienne Westwood Melissa and my Kenzo espadrilles ones – I don’t really own any normal flats or sandals. Not even a pair of plain black ballerina style ones. Nada. So, I’ve been window shopping today and had to share a few favourites I found along the way. I *may* have ordered some beautiful new flats which should be arriving on Monday, but I’ll blog about them when they get here. 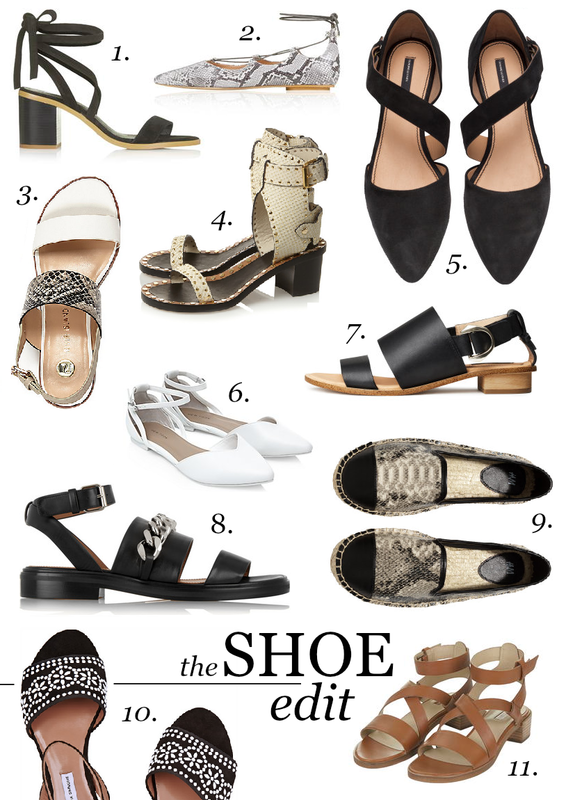 I have particularly strong feelings towards the first pair of sandals and the snake print flats, they’re both pretty high on my wishlist! I’d love to get some Isabel Marant sandals, but I’ll have to dream on for now. What do you think of the shoes in my wishlist? Make sure you enter my USA beauty giveaway! Next Post STYLE: What Would You Wear To The Races?